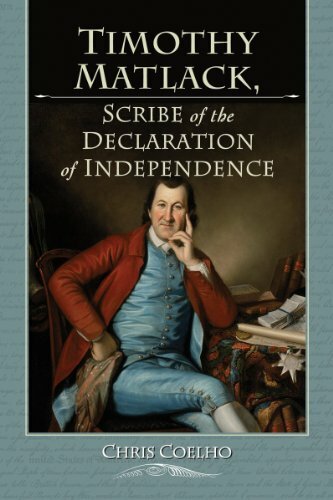 Matlack wrote the copy of the Declaration of Independence that the other Founders all signed. Oh, and he may have been the one to push Benedict Arnold over the edge of treason. How does an unknown beer bottler get credit for writing the Declaration of Independence? Sure, Jefferson authored the Declaration. But it was Timothy Matlack who engrossed it. Timothy Matlack was just five years removed from time spent in debtors’ prison when he was hired by Charles Thomson, Secretary of the Continental Congress. Now a beer bottler, Matlack had become known for beautiful penmanship. As a Clerk for the Congress, Timothy was asked to engross important documents. Engrossing, to clarify, is the process of transcribing a document with the intention of making it look prettier. The first document Matlack was asked to engross was a letter from the First Continental Congress to the King of England. After this, he engrossed George Washington’s commission as Commander an Chief of the Continental Army. All Officers where given a commission and Washington was no different. It served as his authorization to act as Commanding General of the Revolutionary War. George returned this piece of paper to the Continental Congress eight years later when he offered his resignation to Confederation Congress President Thomas Mifflin. After the Declaration of Independence was approved on July 4, 1776, the document was sent to the publisher. John Dunlap printed the famous broadsides which were sent throughout the States. It was decided that a copy of the Declaration should be engrossed for the purpose of the Delegates to sign. This copy, now known as the Matlack Declaration, was written by Timothy Matlack. OK, maybe he didn’t write the Declaration, but whenever you see a copy with all those signatures at the bottom, now you know whose cursive that is above. Timothy Matlack did a whole lot more than just copy other people’s work. Tim joined the Philadelphia Militia as a Colonel and led them across the Delaware River with Washington’s Army. Matlack returned home to assist in the creation of Pennsylvania’s first Constitution. He then served as Secretary to the Executive Council, one of the most powerful positions in the State. As if he hadn’t already put enough of himself into American History, Timothy Matlack played a huge role in the nation’s greatest treason. After the British had evacuated Philadelphia, Washington placed Benedict Arnold as Military Governor of the city. Arnold, who had already been passed up for promotions due to shady politics, was now walking with a limp due to his many wounds sustained fighting as one of the colonies greatest heroes (at that time). Matlack was one of several residents who did not like how Arnold ran Philadelphia and succeeded in getting him Court Martialed and reprimanded by Washington. This seems to have been the last straw in a long train of abuses which turned Arnold against the United States. Shortly thereafter, Matlack was himself elected to the Continental Congress. After a year in that position, Timothy took on several positions, including surveying large tracks of Pennsylvania. Additionally, he was one of the earliest abolitionists in the United States and was a major reason Pennsylvania became the first State to outlaw slavery. Eventually he retired to a house in Lancaster where he became known for his peach orchard. Timothy Matlack spent his golden years as America’s most respected grower of that tasty fruit. Want to learn about other Founders who actually wrote the things they’re known for? Want to read a biography of Timothy Matlack? ‘Scribe of the American Revolution’ is one of two bios I’ve come across and, in my opinion, is the better of the two.